Oatmeal was another go to for Mom. Recently Mom told me she loved oatmeal. I was a little confused. Once, I remember Mom making us oatmeal for breakfast. She served all of us and not herself. I recall her saying, “I don’t like oatmeal.” It makes me wonder if she just said that because there was just enough for us, and not for her. How many times did Mom go hungry for our sakes? I love you Mom. Papas used to eat a lot of oatmeal before he turned one. Then he went on strike from all food! Everything I do, I do it with papas in mind. So if he didn’t like something I gave up on it. No more nice mommy! Hello my name is Tami and I have spoiled the kid rotten. Seriously parents, don’t repeat my mistakes. If your child doesn’t eat I promise it will not hurt them to go hungry until the next meal. Esposo and I would worry then rush out to buy him all the things he would eat…french fries and pizza. I am a horrible person! We are now struggling to get him to try foods that are healthy and nutritious. It’s a battle that will be won! 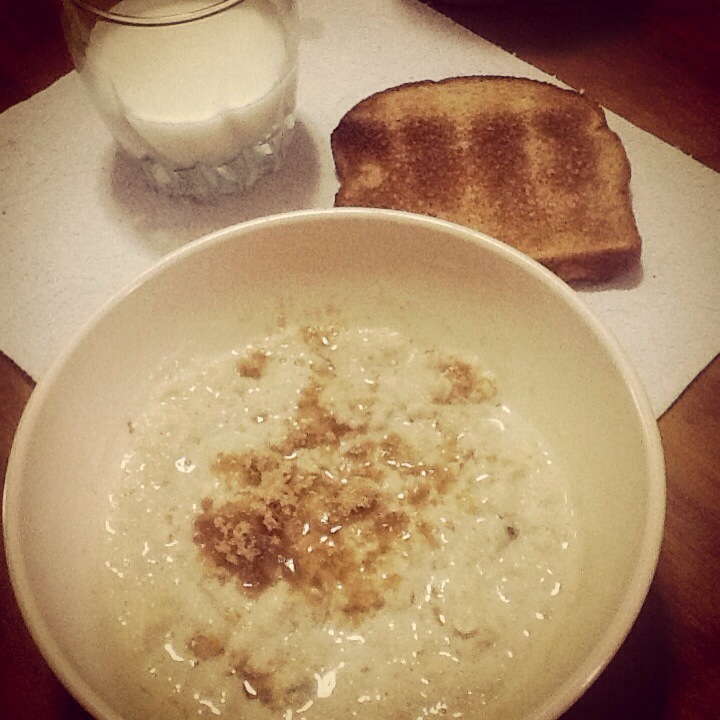 Yesterday I made oatmeal before heading out to worship. Papas used to eat a lot of it before his strike. He took one look at it and said ” No thank you.” I insisted and his voice raised, “NO THANK YOU!” Thanks for being polite kid, but you will not move until this oatmeal is finished. 1/0 Mommy! I added apples yesterday and I told Papas I would try bananas today. I use the quick cook oats and let them cook for just a little longer than the 5 minutes. I like oatmeal creamy and milky. Bring water to a boil a long with the apples. Add oats, raisins and desired amount of brown sugar. Let the oats get soft and add the milk. Let simmer on low until the oats are a little more softer. Add more sugar if desired. You can substitute with any other fruit you like. This smoothie recipe comes via Los Rodriguez Life. Thank you Leslie for sharing. I literally made this as soon as I read the blog. I pretty much used the same ingredients. I adjusted the measurements some and used vanilla soy milk in place of regular milk because at the time I was on an all natural kick. Almond milk would even work wonderfully. We could even call this the Elvis. 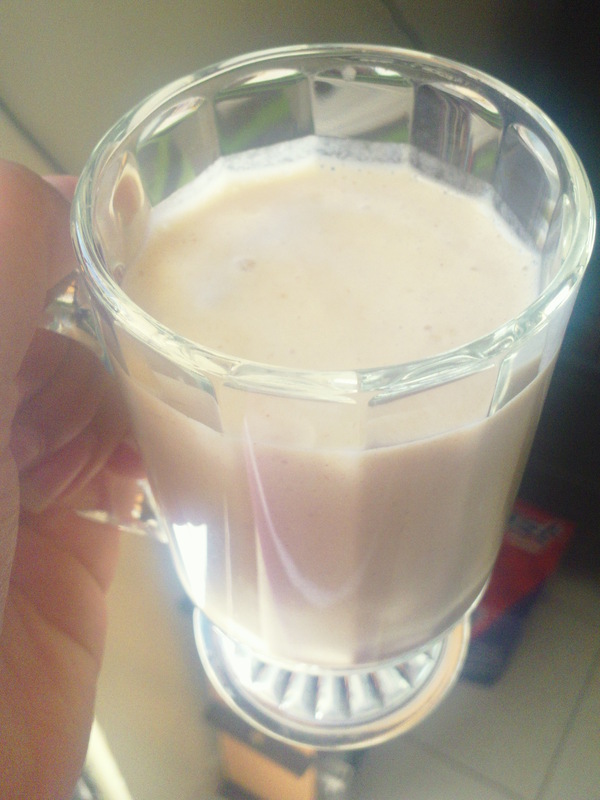 In a blender I chucked in 1 cup of milk, 1 1/2 bananas, 2 tablespoons of peanut butter, 1 tablespoon of honey and about 3 ice cubes. Blend very well until smooth. That simple. If it’s not thick enough for you try using less milk and an extra ice cube. I think I went a little heavy on the peanut butter. I love peanut butter. This drink reminds me of a time when Esposo and I were addicted to the peanut butter malts sold at Sonic drive-in. I gained all the weight I had previously lost drinking those things almost every other night.